The statistics show that Safari is the most popular web browser coming to our Modesto Plastic Surgery websites. I did the analysis for the last 18 days in April of 2013. I hadn’t looked at this chart in years. I still remember MSIE (Internet Explorer – Microsoft) being the dominant player for the longest time. I think this is probably due to the popularity of iphones and ipads. The other category is large too, but unfortunately it doesn’t show the breakdown. The statistics program that figured these things out are old. Perhaps Google Analytics has some data regarding this which is more up to date – I would imagine that if it were present in Google Analytics, there would be a listing for Google’s Chrome Browser. 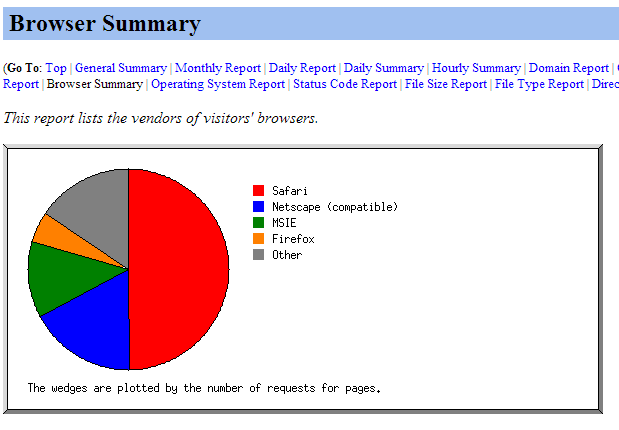 On the chart above, I’m not entirely sure what is Netscape compatible. But this data is generated from DreamHost where I keep some of my webpages. That includes this blog. This entry was posted in SEO, Social Media, Statistics, The Web for Plastic Surgeons, Web Pages and tagged browser, chrome, Google Analytics, internet explorer, ipad, iphone, Modesto, safari, statistics, web browser on May 1, 2013 by Calvin Lee, MD.